Check out our blog posts for advice about tutoring, the latest trends in education, and more! Ann Dolin’s newest book offers key data and ‘in-the-field’ information about nearly 100 private schools and application processes across the Washington, DC metropolitan area, with a concerted focus on the importance of selecting the right school for each individual child’s learning style. This book is for any parent who has ever experienced stress, self-doubt, and anxiety over their child’s homework. 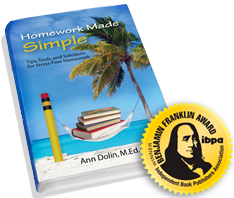 Ann Dolin reveals the core problems that commonly lead to homework stress. She identifies six key student profiles: Disorganization, Rushing, Procrastination, Avoidance, Inattention, and Frustration and provides tips and strategies to deal with the each type. From dealing with an elementary student who hates to read to understanding the role and importance of executive functions, here you’ll find some of our most popular educational articles.